Find My Workspace lists over 95% of the business centres market in Hove. Simply click Request Quote to check pricing for one office, or Add to Basket for multiple offices. 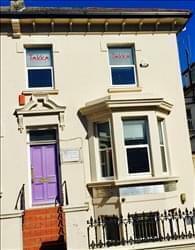 This second floor building is located on a busy street in Hove. The space is self-contained it has its own entry door system. The office can be provided with Wi-Fi or there is a current phone line in. As well as a spacious office suite there is also a large amount of storage attached to this office. This is lit and accessed by small side doors to the attic space. Located in the heart of Hove, this centre offers great co-working space containing everything you need to run your business without any added hassle and with the opportunity to network with other similar minded people. As well as the open work space with dedicated and hot desks, this centre offers the option of private offices. This centre has many amenities including meeting rooms, event space, a members directory and portal, bike storage, and free tea, coffee, fruit and cereals. You will have everything you need in order to fulfil your full business potential. To obtain information for your selected East Sussex Business Centres, please tick the "Add to basket" box for each office you prefer and complete the form below. We will then send a detailed report via email.